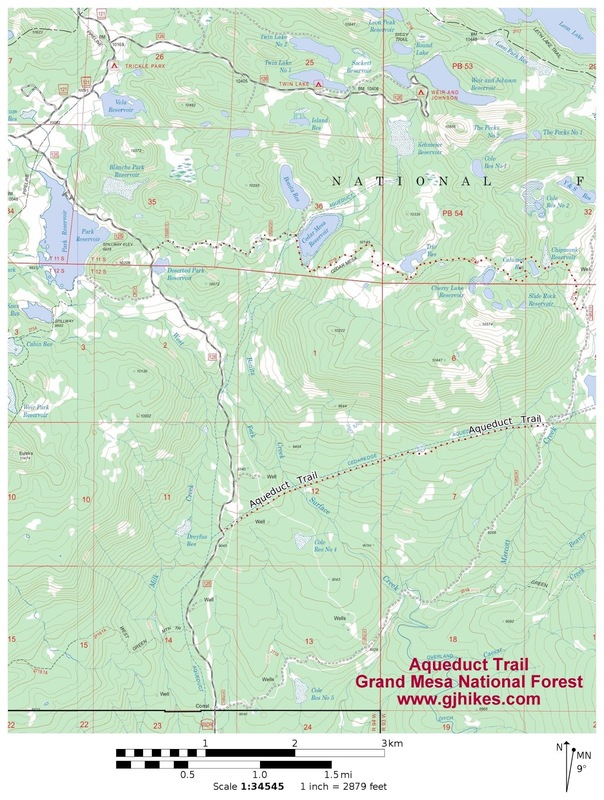 The Aqueduct trail is located in the Grand Mesa National Forest near Grand Junction and Cedaredge, Colorado. 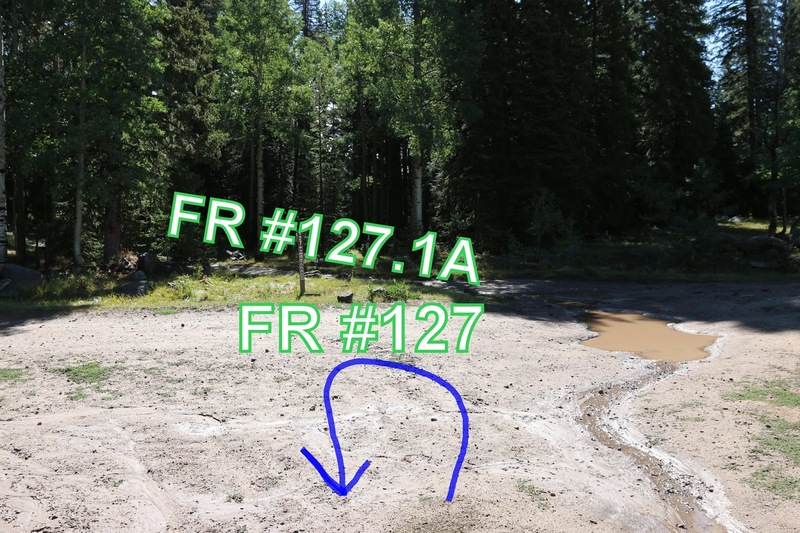 The trail begins off of the Surface Creek Road, aka Forest Road #125, and ends at Forest Road #127, aka the Leon Lake Road. 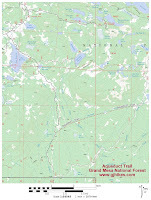 This post starts at the eastern trailhead off of the Surface Creek Road. To get there find your way to the Grand Mesa Visitor Center on Highway 65 and turn east. The road starts out as the Baron Lake Road but becomes the Trickle Park Road as you continue to drive. Its official designation is FR #121. Follow it for about 7.8 miles and turn right onto FR #125 which is the Surface Creek Road. Continue for 3.7 miles where the trail begins on the left. There isn't any room to park right at the trailhead but there is room for 1 or 2 vehicles just past it. The trail is a little rocky as it begins climbing away from the Surface Creek Road. The route follows a mostly straight course as it was originally built when a pipeline was buried to carry water from the Marcot Park area. The elevation profile for the Aqueduct trail shows its general uphill trend as it travels from west to east. The biggest downhill section comes up at the half mile point where the trail drops into the Surface Creek drainage. Surface Creek usually has a pretty good flow of water so if you are crossing on foot a pair of trekking poles will come in handy. After crossing Surface Creek the trail passes through a gate where it begins climbing once again. Parts of the trail are a little rocky but there are also some stretches that are a lot smoother. At the 2.5 mile point the Aqueduct trail reaches Forest Road #127 and comes to an end. This is also the spot where Forest Road #127.1A begins. There is a lot more room to park and to camp on this end of the trail but the road getting to this point requires a moderate to high clearance 4-wheel drive vehicle. This is what it looks like where we parked near the west trailhead along the Surface Creek Road. There is room for a couple of vehicles as long as the first one there parks off to one side and not in the middle. There is alway a chance that someone might be camped here but there isn't a fire ring so it probably isn't happening a lot if at all. The restrictions for ATVs on the Aqueduct trail are 50 inches wide or less but at present there isn't a trail squeeze on either end of the trail. That might be because they have to occasionally drive vehicles on the trail to service the pipeline. When we took the photos for this post we were hiking the Aqueduct trail and it was pretty nice for that. Mountain bikers might not like it quite as much depending on how they do on rocky surfaces. If you would like to see it for yourself then all you have to do is 'Take a hike'.